One very excited birthday boy this morning: Joe turns 8! Birthday breakfast opening presents on concrete steps leading to the beach. Sand flies and crows desperate to join our party. We load the bikes and transfer 8 bobbing balloons from the tent to the bicycles. Special treat custard buns for elevenses. We eat this sitting on the curb of a convenience store carpark. A couple of Japanese cycle tourists join us. I write “Allez Allez” on one of their panniers, we get ” おたんじょうびおめでとう” on one of our balloons. Photo pose, “Hi Cheese Oo” holding up our forefinger and middle finger in a ‘V’ shape: Victory Salute. Victory for getting this far: for getting Joe to 8; for getting to 169 days in Japan. In the late afternoon we cycle into a fierce headwind. A change in the usual cycle train, I take the front and try give shelter behind me. Slow, grinding pedalling. We strike camp behind the loos of a huge public park. As a birthday treat, Sam & Joe are excused from helping. They run off, find a hill, and roll down; they blow soap bubbles; they punch the ‘punch balloon’. Wind blows bubbles away and balloons pop. No tears. After a supper of spaghetti topped by fresh asparagus, sesame seeds, garlic & olive oil, we meet in the wind protected section of the toilet block. Heidi comes out the female section, carrying four apple & custard buns (plastic wrapping in the bin) and candles. On the far side of the park a man walks to the nearby ONSEN. Drifting towards him, from the direction of the toilet block, comes that old familiar song, “Happy Birthday to you…hip hip hooray”. Happy Birthday Joe! Keep your enthusiasm and be gentle to yourself and others. Tomorrow we will find out the referendum result. We are 8 hours ahead of the U.K., so will follow it all day as we find internet hot spots on the road. We’ve been reading news and analysis quite closely over the last couple of weeks. Hope we return to a stable country that is part of the EU. And which, unlike our temporary home here in the Far East, welcomes diversity and gets on well with it’s neighbours. At around 3pm, in a roadside shop & cafe, with the wind picking up and clouds forming in the distance I told Heidi that 52% of the UK voted to leave the EU. Heidi smiled at me; waiting for me to say “only joking!”. No joke. But no time to dwell, the rain is fast approaching and another tunnel awaits. With heavy rain and wind forecast (weather & political) for the next couple of days (or years), we’ve managed to book a little cabin. Thank goodness for these reliable forecasts, goodness knows how we’d manage without them. I suppose we’d manage somehow: taking each day as it comes. We cycle up a steep hill to find the campsite, and are rewarded with a spectacular view of the peninsular we’ve been cycling for the past few days: a series of fading headlands like layers of scenery backdrop in a theatre. The next section we must cycle is covered in cloud & rain. When we unload the bikes we notice another completely broken pannier. We’ll get it sorted somehow. 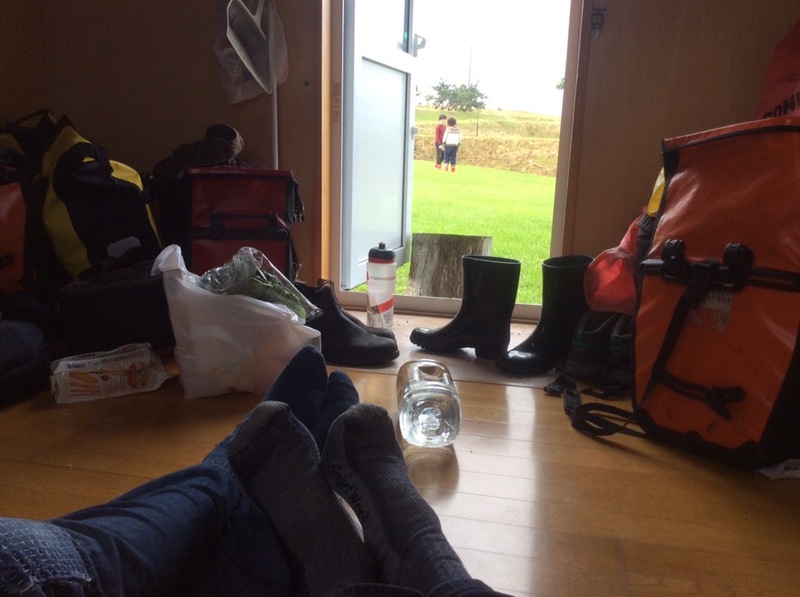 The cabin is smaller than expected (2.5m X 2.5m) but there is a coin laundry, drier, and shower facilities on site. The town is far below us but we find a 568 stair shortcut. A bit like BREXIT, cycle touring is about making the most of situations way beyond your control. There are other towns we’d rather be stuck in, but this one will do just fine. For now. It has to. The sun will eventually return. For the next few days we’ll just cuddle together and keep each other safe & dry. As predicted the wind & rain arrived and battered our solid wee cabin. Japan gets a lot of rain generally, and Hokkaido is no exception. A quick google search confirming this: the average rainfall in Hokkaido’s driest month is roughly the same as Edinburgh’s wettest month. But unlike Edinburgh, the long range forecasts here are a lot more predictable and reliable. Today we got our clothes washed & dried. We listened to music. We drank cups of hot drinks. We chatted. We kept snug. We walked down 568 stairs to the town and found a great wee shop, a bakery, and a library. For lunch we found a pizzeria with good wi-fi. Haircut. Beard shaved off. The everyday mundane during uncertain times. Sam & Joe played outside between the showers while Heidi & I discussed BREXIT: some messy divorces coming up. In 10 days time we will be returning to a very different UK to the one we left 6 months ago.